Excitement buzzed on the night of May 25th, as Bus Stop Films along with AFTRS and Screen NSW prepared for a night of rich discussion surrounding inclusion and diversity both in front of the camera and behind it. Our master of ceremonies was the effervescent Tracey Corbin-Matchett, Project Officer, Stakeholder Relations and Industry Development at Screen NSW, who guided us through a range of speakers contributing alongside Jamie Brewer. Among the speakers were Courtney Gibson (CEO of Screen NSW), Martin Brown (head of awards courses at AFTRS), Paralympian Paul Nunnari, film critic Luke Buckmaster, our very own Film Club participant Nathan Basha, and Co-Founder and Executive Director of Bus Stop Films, Genevieve Clay-Smith. Together, they shared their thoughts and reflections on the representation of disability in the film industry and called on everyone to consider the impact of subconscious bias as well as encourage opportunities that promote the inclusion of people with disability in the film and television industry. Jamie Brewer, star of American Horror Story and advocate for people with a disability, graced the night with her powerful talk and engaging answers during a Q&A session with Bus Stop’s co-founder Genevieve Clay-Smith. Powerful words! ? @MsJamieBrewer "We can advocate for a more healthier and #inclusive world today" ? The stories within film and television are supposed to reflect our society. However, the lack of diversity on our screens highlights a major issue that the voices of those with a disability are not being heard or represented and if they are they are being represented without consultation. Paralympian and Manager of Event Access and Inclusion at the Department of Premier and Cabinet, gave a brilliant speech boldly declaring that disability awareness was on the rise but we still need more authentic stories that represent people with a disability in an empowered way. Paul urged us to redefine the current associations connected to disability – that “advantage, opportunity, beauty, confidence, contribution, and strength” should be in our vocabulary when we describe this community. And a key game changer is Bus Stop Films, which he described us as ‘a force of natu<re’. “When I watch those films, “Be My Brother”, “Work Mate” and “The Interviewer”, I feel proud to be a person with a disability. Excitingly we had representatives from Job Support in the room on the night, Job Support is a company that helps people with a moderate intellectual disability gain employment in the mainstream work force. Nathan urged anyone thinking of employing a person with a disability to talk to Job Support representatives at the end of the night. Film critic for the Guardian, Luke Buckmaster provided context for the evening, he took us through a brief history of the representation of disability in Australian cinema. He stressed that the pool of texts to choose to speak about was limited, indicating that we definitely need more representations of characters with a disability on our screens. He showed clips from “Annie’s Coming Out” and Rolf De Heer’s “Dance Me to My Song” of which Heather Rose was the writer, a woman with cerebal palsy. Buckmaster praised the performances of the cast members who had a disability, saying they gave more compelling and authentic performances as opposed to the performances given by actors without a disability. Finally, Genevieve ended the night with a warm thank you and a perfect summary of the rich discussions. 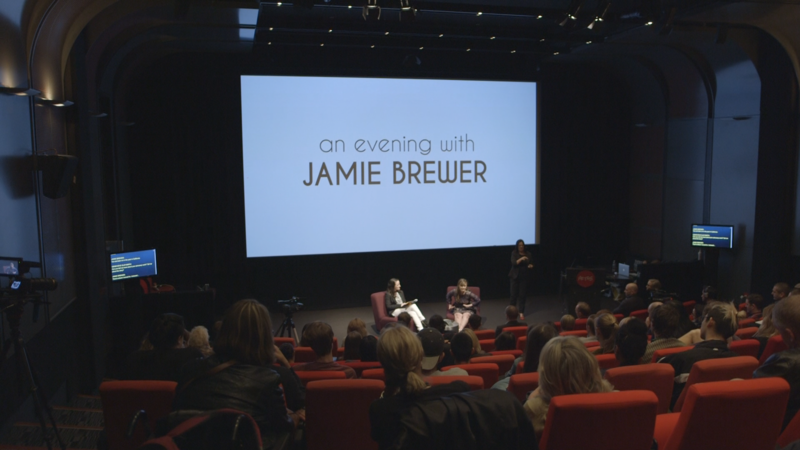 Thank you to AFTRS and Screen NSW for helping us to make this event possible, and thank you to all those who attended. Let’s be inspired to use our voices, question our biases, and lift our expectations. Lets create a world where inclusion and diversity are the norm.